Recipe creation, for me, often originates from the practical standpoint of “I need to use X and Y and Z before they go bad – what can I incorporate them in?” I’m sure many of you can relate, especially at this time of year, when swoon-worthy produce is everywhere. It’s too easy to buy too much up at once at my beloved neighborhood Italian produce market – it just all always looks so lovely! 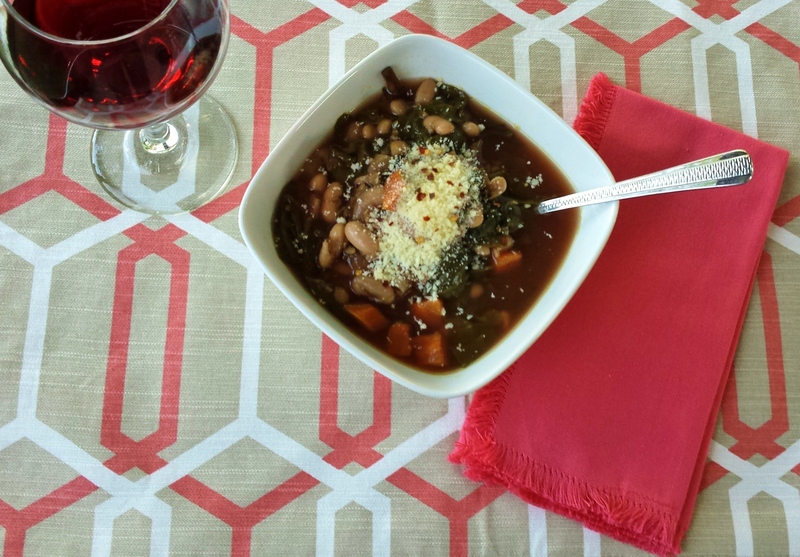 Having bought a bunch of Swiss chard recently that I knew I needed to use soon – and having made vegetable broth recently, as well – I threw together this simple soup using other ingredients I had on hand. My instinct would’ve been to add both more cannellini beans and more bulgur (I had even a bit less of the latter than the one-half cup I’ve assigned to this recipe), but in both cases I was using the end of my supply of each. But the shortages ended up being beneficial, because the result was a lighter, more broth-based soup that is more appropriate for summer than the heavier, more ingredient-laden soups I often gravitate toward. Lighter is better in this heat! In case you are interested in making your own vegetable stock like I do, here’s the link to my Spicy Black Bean Soup recipe, where I explain how I do so. It’s incredibly easy! And if you don’t have any vegetable scraps saved up right now, you can make the stock by boiling a selection of whatever vegetables you do have on hand – though from an economic and waste-reducing perspective, it is really fun to save up your scraps and make it that way. Also, if you are using dried beans as I did, there will be a bit of ahead-of-time prep work involved. You’ll need to soak the beans overnight – or for at least eight hours – in a bowl covered by several inches of water. Then drain and rinse the beans in a strainer and add them to a large pot with several inches of water again covering them. Bring them to a boil, then reduce the heat so that they’re at a gently rolling simmer and cook for one hour. Drain and rinse them again, and then you’ll be good to go! Once you’ve boiled the beans as well as made the homemade vegetable stock (both of which can be done a day or two in advance), making the soup itself is incredibly simple. Cook the bulgur according to package instructions (the one I use has me bring a half a cup of it to a boil in one cup of water, then reduce it to a simmer, cover it, and cook it for 15 minutes). To a large pot over medium heat, add the grapeseed oil, onion, and carrot. Cook for about five minutes, stirring frequently, then add the garlic and cook for another minute. Remove from heat and set aside until the bulgur is done. Then add the vegetable stock, beans, swiss chard leaves, bulgur, and salt and pepper to the pot containing the onion, carrot, and garlic, mix well, and let simmer over medium-low heat for about 30 minutes. Voilà – you are done! Makes 4-6 hearty servings.